WASHINGTON – Today, Family Story released a new report documenting discrimination against unmarried families and how conservative funders have promoted the supremacy of the married family to the detriment of all other families and historically marginalized people over decades. The Case Against Marriage Fundamentalism: Embracing Family Justice for All outlines how ‘Marriage Fundamentalism’ — the belief that a married two-parent family is the superior form of family — has been a key plank of conservative-backed culture wars, leading to brutal results for LGBTQ, and single-parent, as well as communities of color most impacted by mass incarceration and immigrant detention. The report comes at a time when half of all adults are unmarried and less than half of households contain a married couple, but there remains a long list of legal rights, benefits, and privileges available to married people which are unavailable to others. These gaps in public policy create serious consequences for many adults and families who do not fit the nuclear family box, impacting low-income people and people of color the worst. Marriage fundamentalism has caused, and continues to cause, considerable political, social, and psychological harms without any offsetting benefits. Unmarried mothers, Black women and men, and LGBTQ+ people are among those most harmed. An objective evaluation of the evidence does not support the contention that the two-parent family (married or not) is the superior family type for children, or that increasing the marriage rate will reduce inequality and poverty. Defund government-backed “marriage supremacy:” end marriage propaganda. Ensure government policies at the local, state, and national level support all families, not just married families. Expand legal options for unmarried adults and families. Note to Press: Nicole Rodgers, Executive Director of Family Story, along with the lead report researchers, are available for interviews around the report and discussing the changing face of families in America. To arrange, please contact Nick Hatcher at 919-802-5663 or nick@megaphonestrategies.com. Family Story is a think tank founded to recognize, validate, and protect the many ways individuals form and re-form families. The Case Against Marriage Fundamentalism: Embracing Family Justice for All documents how conservatives, with help from centrists and liberals, have promoted the supremacy of the married family to the detriment of all other families and historically marginalized people. Marriage fundamentalism is a set of beliefs and values that view the “traditional” married family— a man and woman in their first marriage—as the most fundamental unit of society and the best type for raising kids. But this viewpoint isn’t backed up by the science, and is increasingly at odds with public opinion. With funding from conservative foundations, para-church organizations like Focus on the Family and Family Research Council and think tanks like The Heritage Foundation and American Enterprise Institute have promoted marriage fundamentalism as part of an ongoing culture war. The result has been the continued exclusion of unmarried adults and families from access to benefits and privileges available to married couples, wasteful government spending on marriage promotion, and an overall failure by government and elected officials to meet the real needs of American families. The reality for families today is much different than government policy would have you believe. The share of unmarried household has doubled since the end of World War II, and only 48% of American households today contain a married couple. 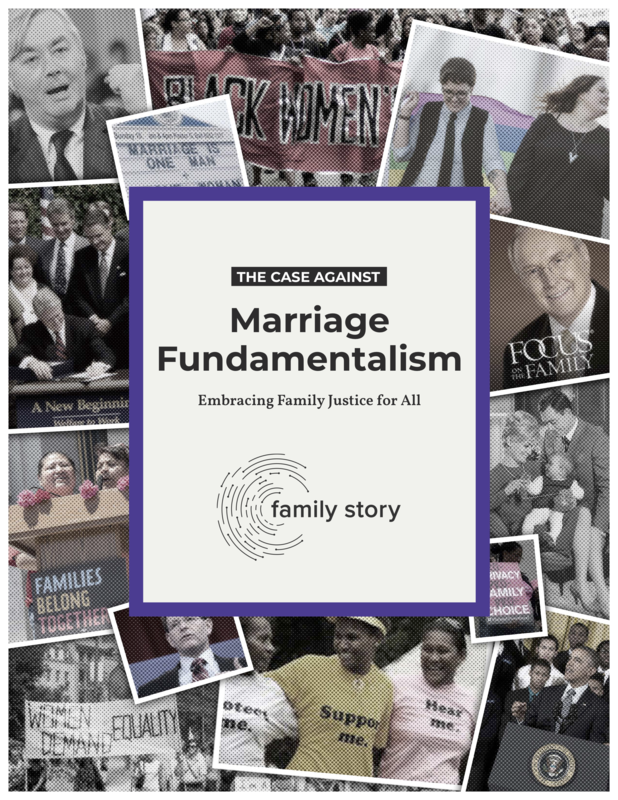 Families across America are changing, and this report lays out a case for rejecting marriage fundamentalism and offers a new way forward for all of us – family justice – that meets the needs of families in all their forms. An objective evaluation of the evidence does not support the contention that the two-parent family (married or not) is the superior family type for children, or that increasing the marriage rate is necessary to reduce inequality and poverty. The conservative push for consensus on the supremacy of marriage has met little resistance from liberals or centrists — despite the rise of the unmarried majority, and broad public acceptance of it — reinforcing policies that exclude many types of families and individuals from the legal rights, benefits, and privileges that married couples enjoy. Despite the evidence that economic inequality and misguided policy have negatively shaped and constrained family-related choices and relationship health and stability, little effort has been made to fundamentally reform economic and social policies in ways that would benefit all families. View family, care, and community, as central and enduring parts of most people’s lives, and critical to children’s well-being and success. A comprehensive and robust agenda for family justice needs to include both policy and cultural change. Repeal the Healthy Marriage Promotion program. Ensure crime, immigration, and child welfare laws minimize forced family separation and harm to children. Expand legal options for unmarried families. Make civil unions and registered partnerships possible for people across America, and provide easily accessible information for all Americans on the rights and legal obligations of all of these legal family options.